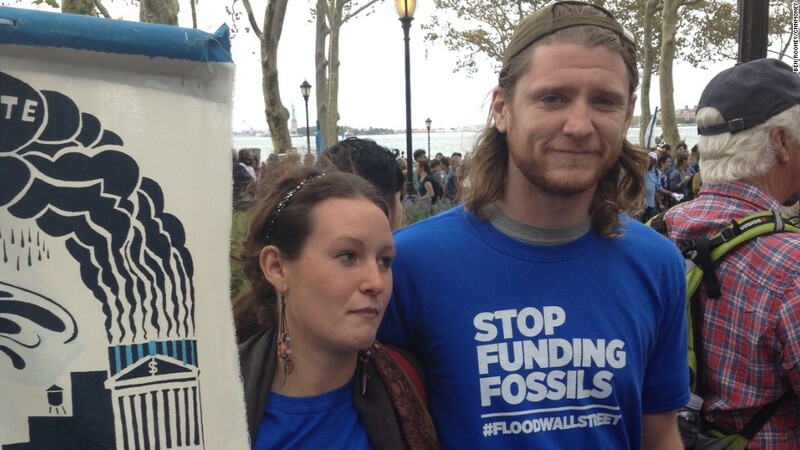 Scenes from #FloodWallStreet: "Corporate capitalism = Climate chaos"
Hundreds of protesters marched through the financial district in New York Monday to protest the role big business plays in climate change. 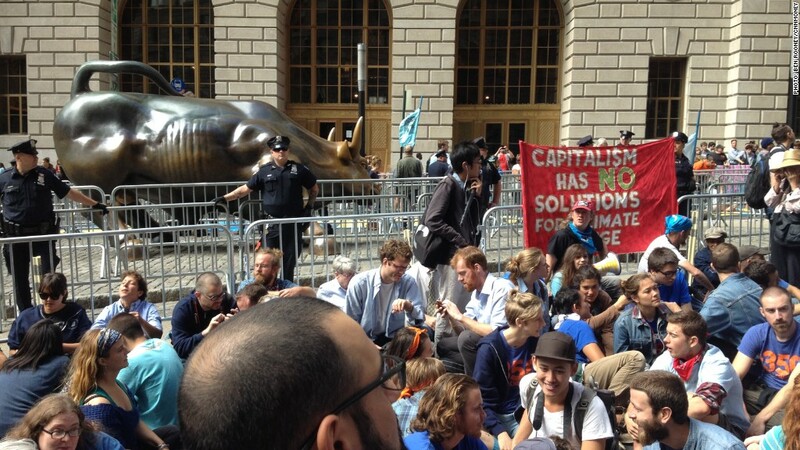 The demonstration, dubbed #FloodWallStreet, blocked traffic near Wall Street. It came one day after tens of thousands of people took part in the People's Climate March in New York City. 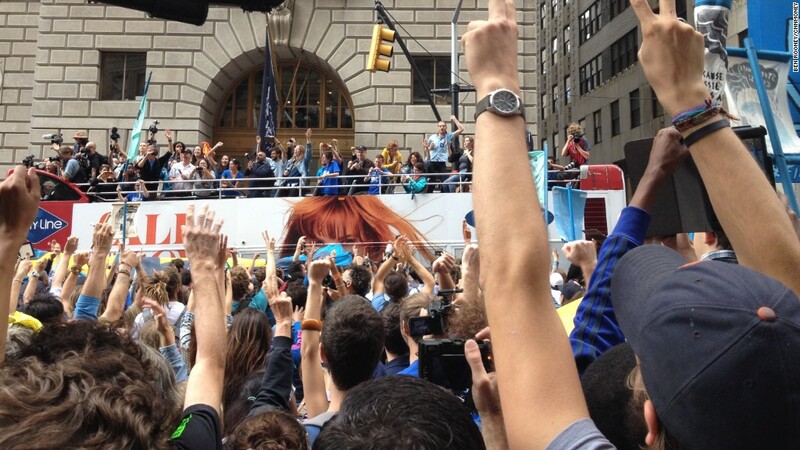 That march attracted numerous celebrities from all walks of life including former U.S. Vice President Al Gore, U.N. Secretary General Ban Ki-moon, comedian Chris Rock, as well as actors Leonard DiCaprio and Mark Ruffalo. And Barry Knight, who came from Massachusetts to the the march. 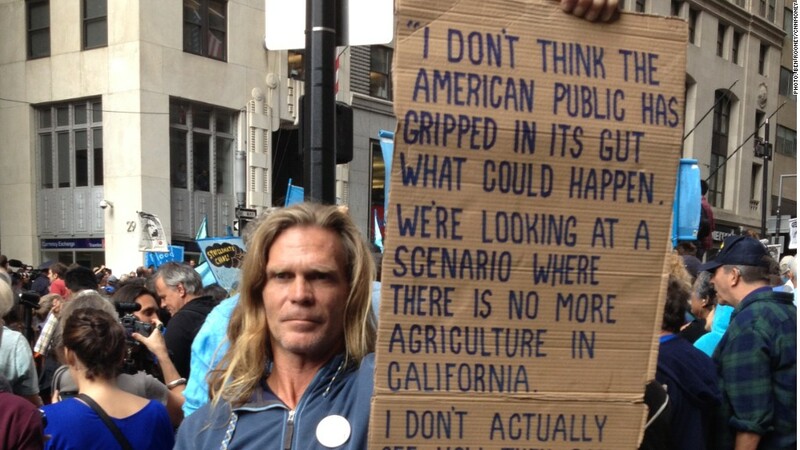 Knight held up this sign and told CNNMoney: "If you think this is inconvenient, think about how inconvenient it will be for your grand kids when they don't have a sustainable planet." 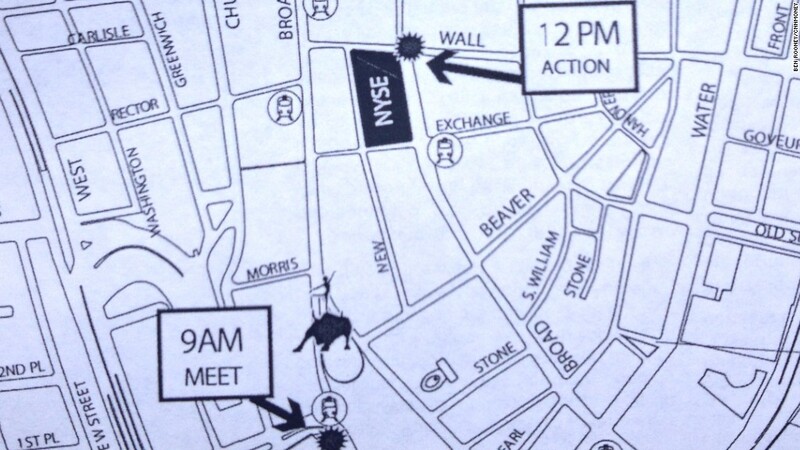 The protesters had initially planned on meeting a few blocks south of Wall Street, as seen in this map. The plan was to march on Wall Street and "shut down" the New York Stock Exchange. 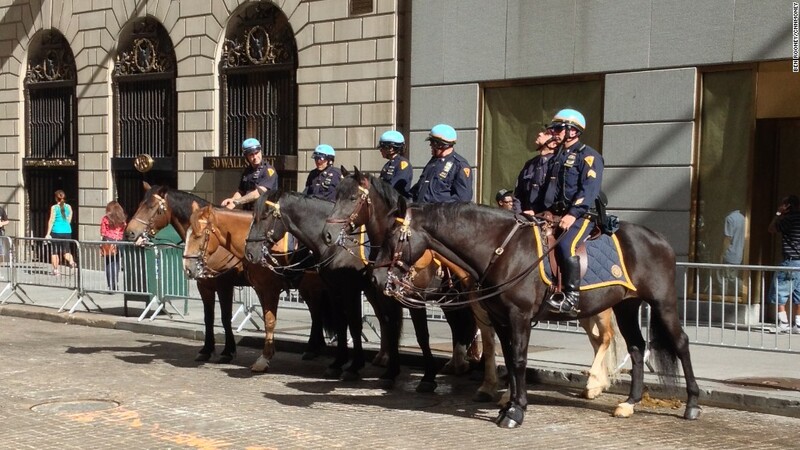 However, the New York Police Department was out in full force, some on horses, and their barricades forced protesters to abandon that plan. 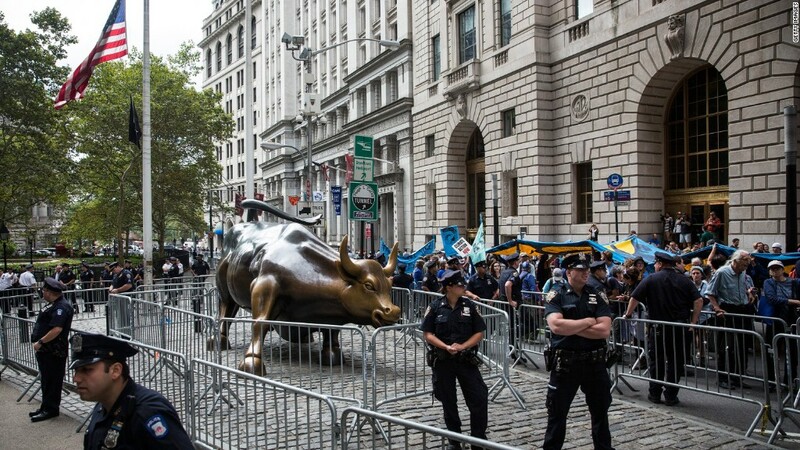 Still the protesters, who argue that capitalism is to blame for climate change, surrounded the iconic "Charging Bull" bronze sculpture in lower Manhattan. 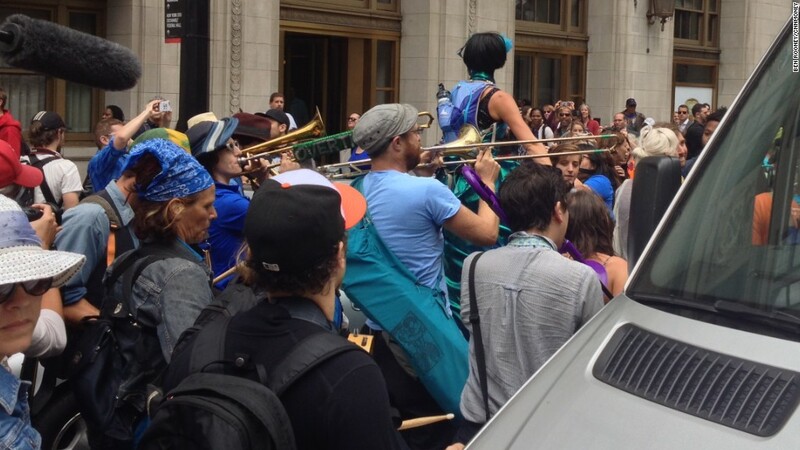 The atmosphere was boisterous, with protesters wearing costumes and dancing to the beat of a marching band. 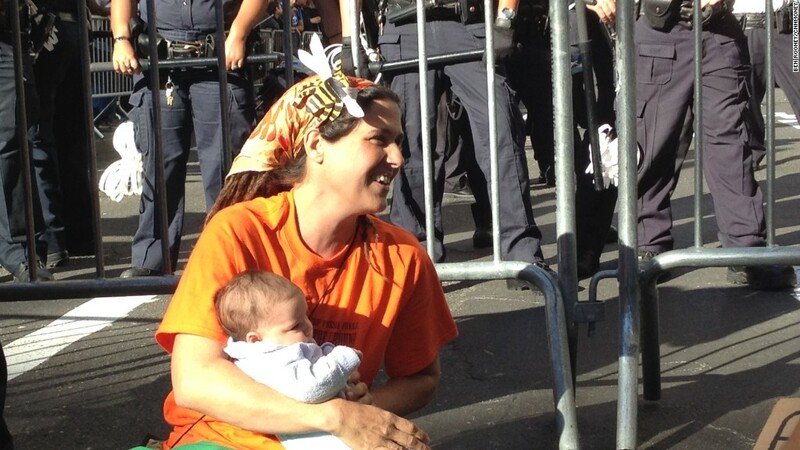 And (below) Stacy Helsee, 41-years-old, brought her two-month-old baby Joy Liberty Wildflower for her first protest march. Protesters chanted slogans demanding "climate justice" and carried signs that said "Corporate capitalism = climate chaos." Organizers estimated that there were about 2,500 people at the demonstration. 102 people were arrested on charges of disorderly conduct, according to the New York Police Department. CNN's Rob Frehse contributed to this report.